Effective community development means that many different stakeholders have to work together: governments, development organizations and NGOs, and most importantly, the people they serve. 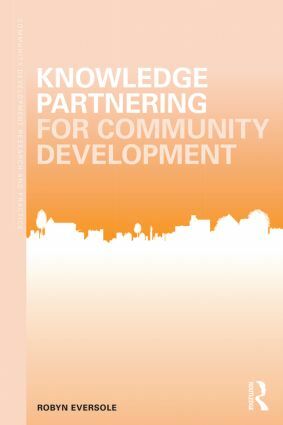 Knowledge Partnering for Community Development teaches community development professionals how to mediate community needs and development agendas to make community-based solutions for development challenges. Based on the newest research in community and global development, Eversole shows readers a strong research and theoretically based framework for understanding local development processes, and gives them the skills to turn this into cutting-edge practice. Each chapter features global case studies of innovative community-state partnerships, and practical application exercises and strategies for professionals looking to bring new approaches to their research. Knowledge Partnering for Community Development is essential for community workers and students of community development looking to bridge the gap between research insight and best practice between community actors.